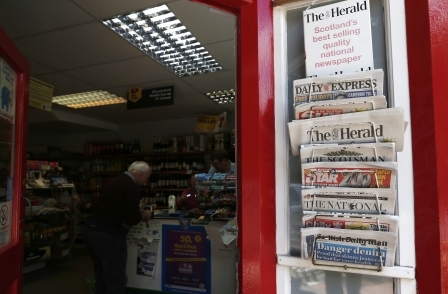 The Scottish Social Attitudes survey found that last year 41 per cent of Scots "regularly read one or more daily morning newspapers". This is down from 76 per cent in 1999. Meanwhile, the 2014 survey found that 33 per cent of Scots check online news or newspaper websites at least once a day. Some 38 per cent of the 1,501 surveyed in 2014 said they never read news online. According to the survey, 46 per cent of the 250 people judged to have come from the most deprived areas never read online news. Every year since 1999, social researcher NatCen has surveyed around 1,500 Scots "on the basis of random probability sampling" for Scottish Social Attitudes. Table 1: Do you regularly read one or more daily morning newspapers? The survey group were also asked: "How often, if at all, do you look online at a news or newspaper website?" Some 12 per cent said they did so several times a day, and a further 21 per cent said every day. Meanwhile, 11 per cent said they did so several times a week, 11 per cent said at least once a week or a couple of times a month. Seven per cent said they did so once a month or less than once a month, and 38 per cent said they never do. *NatCen used the Scottish Index of Multiple Deprivation, used by the Scottish Government, to categorise deprivation areas into quintiles.